The race for Vermont governor is already proving to be pricey, with nearly all of the declared candidates exceeding the half-million-dollar mark five months before the primary election. Tuesday marked the first time since last July that candidates for state office in 2016 were required to report how much they had raised and spent on their campaigns. Two Republicans —Phil Scott and Bruce Lisman — and two Democrats — Sue Minter and Matt Dunne — are competing in their party’s August primaries to succeed retiring Democratic Gov. Peter Shumlin. More candidates are expected to join the race. Lisman, a retired Wall Street executive, amassed the most money, the bulk of it coming from his own pocket. Lisman reported raising $625,345. He contributed $453,843 of that himself. Lisman, who announced his candidacy in September, also spent the most of the four candidates and had the least left in his account. He reported $571,298 in expenses, leaving $54,000. Scott, in his sixth year as lieutenant governor after 10 as a state senator, came to the governor’s race with $94,713 left over from his lieutenant governor campaign account. He raised another $414,345 after announcing his candidacy for governor in September, for a total of $509,058. He spent $216,531. Dunne is a former Google manager and state senator from Hartland who ran for governor in 2010. He reported raising $567,468, including $4,000 from his immediate family. Dunne, who started his campaign earlier than his rivals did, had raised $115,000 before last July’s reporting deadline. Dunne said he’d spent $136,314 since launching his campaign last summer. Minter, a former transportation secretary and state representative from Waterbury, hit nearly the same pace. Minter reported raising $487,557. She spent $159,043 — exceeding Dunne’s spending by $22,700. House Speaker Shap Smith (D-Morristown), who suspended his campaign for governor in November after his wife was diagnosed with cancer, reported he had raised $97,733 and spent $66,513. Smith has not ruled out the possibility of reentering the race, though he has called it unlikely. Nick Charyk, Dunne’s campaign manager, touted the breadth of his boss’ contributions. “We have Vermonters from every county engaged and invested in Matt’s vision of an economy that works for all Vermonters and all of Vermont,” he said. Scott’s campaign claimed more than 1,500 contributors, 97 percent of them Vermonters. “This is truly a grassroots campaign in every way. 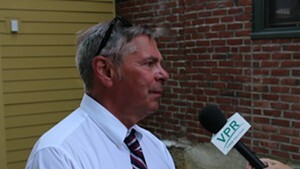 Supporters come from every corner of Vermont,” campaign coordinator Brittney Wilson said. Though he claimed and spent the most money, Lisman discounted the importance of money in the race. In recent years, candidates for governor have at times spent more than $1 million, with elections for open seats generally prompting higher spending. In 2014, when Shumlin sought his third term, he spent about $1 million while Republican rival Scott Milne spent $240,000. In 2012, incumbent Shumlin raised $1.24 million but only spent $328,000. His challenger, Republican Randy Brock, spent $800,000. In 2010, seeking an open seat, Shumlin spent $1.4 million; Republican Brian Dubie, $1.6 million. The next reporting deadline is July 15. They become more frequent as the November general election nears.